A Day Meant for Biking! This was a day meant for biking! The temperature was in the low 70’s and winds were almost nonexistent. We needed more daylight this evening but the sun is still setting early—around 7:00 p.m.—and we didn’t get home from work until 6. Just time to hop on the bike for a quick ride and it sure was zippy! A 14 mph average for us is an awesome ride, a ride when everything just clicks—what fun. These were also bonus miles for the month, giving us a whopping 119 total miles for this March—a new record. March came in and went out like a lamb. Let’s hope April doesn’t allow the lion to wake. 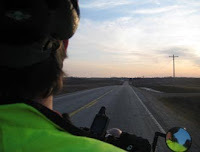 Only time for a short ride tonight—we biked up CR 35 into the wind as far as our ambition would let us and then turned around to enjoy the flight back towards home. The winds are still blowing between 15-18 mph with chance of increasing as the temperature increases through this week. We are curious to see what April will bring but feel we have a good start to the season thus far. We decided (actually, I decided) to bike the South Dover Loop today allowing us to pedal into the wind for the first 10 miles of the ride and enjoy the tail wind while climbing the toughest hill on this route. It’s a challenge to tackle this route so early in the season but we were ready for it. The temperature was still on the cooler side so we layered up. With the wind chill factor, it felt like 43° but anything is doable when the sun shines. 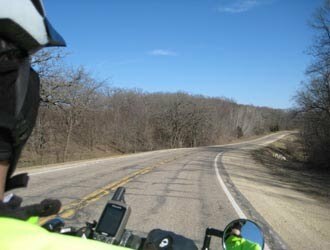 Our Goal of 100 miles for March has now been achieved making our March 2010 miles a new record for us here in Minnesota. The bike had a mind of its own tonight. We set off planning the South Dover Loop but Dennis and I got to talking and before we knew it, the bike was heading towards Brewskies. This worked out fine as we became quite hungry. We continued pedaling down Hwy 14 and then noticed another slow moving vehicle behind but gaining on us. As we turned into Utica, Jim and Shirley met us on their Vision tandem. They saw us coast through St. Charles and decided to follow. We stopped for a quick bite to eat and then headed off into the sunset. We needed to pick up the pace if we wanted to get home before the sun completely disappeared. We clocked a great average for this early in the season and we continue to add miles to our March biking calendar. How many will we be able to get in before April rolls around? We’re hoping for a least 100! The wind out of the South was quite blustery today but we were determined to put on a few miles after work. We headed into the wind beginning our route so that we could enjoy a tail wind home. We have already surpassed the 22 miles for March 09 and we hope the weather holds to allow even more March miles. This could be our area’s first March ever with no snow fall! That should keep us busy this biking season. We won't be alone out there as many of our biking friends will be joining us at these same events. Let's get ready to ride! Now that Day-Light-Savings Time is in effect, we can get some miles in after work. Today we rode the bike into St. Charles for a Subway sandwich and then back home. I sense we are biking stronger this year compared to the ‘09 season as the climb out of St. Charles did not seem much of a challenge. Of course, I’m writing this blog and Dennis might comment a bit differently. We were able to wear bike shorts and jerseys for this evening’s ride enjoying temperatures in the mid-60’s. I do hope the weather continues! 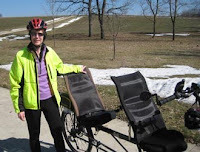 This was our first tandem ride of the 2010 season. The bike returned from its check-up on Saturday and the weather was nice enough Sunday (64°, slight wind) to put the new tires to a test. The bike rode like it was brand new—No funny noises or shifting problems! We did overdress for the day, which we tend to do each new season. I had on my layered fleece, long bike pants and overshoe booties and became very warm just a few miles down the road. It was so great to be back on the bike and we are very thankful for this early spring opportunity. Many vehicles welcomed us as a sign of spring returning. Their smiles said it all: Veerkamps are on the road, it must be spring. Spring has come and biking season has begun. It's time to wake up the Tandem Adventures biking blog. We began the season with a trip to the Blue Heron Bicycle shop in Onalaska, WI to get the Rans tuned up and ready to ride. Kevin did another marvelous job making sure the bike would be safe and dependable. 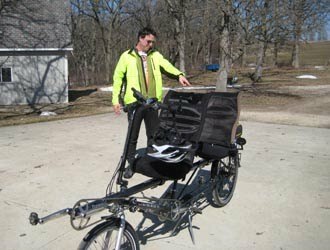 Seasonal repairs included: A new derailer, front and rear tires, new rear chain, handlebar grips for Dennis, replacement of 10 rear wheel spokes and a cracked rear fender, and the addition of new cables and a rear cassette. Most would comment that this seems like a lot of repairs but remember we put an average of 3,000 miles on this bike each year and we want each adventure to be enjoyable. So, we are now ready to ride and share our adventures with you all. Enjoy!